I'll be out at the Spring Home & Garden Show at the Portland Expo Center next week: February 18 through 22. I'll be representing the Oregon Cactus and Succulent Society and selling plants. A portion of the proceeds goes to the club for purchase of new books for the club library. If you live in the Portland area come on out. I'd enjoy meeting you and, of course, talking cacti & succulents. One of the worst jobs I can think of is cleaning out a messed up oil heater. That's what I spent most of today doing. The filter needed cleaning; the fuel line needed cleaning; the burner pot needed cleaning. Then...I needed cleaning! Oh well, it's done. Now I can get on to the more pleasant activities like ... applying insecticide. Ah, yes. Ain't retirement fun??? Enough already! Here's another work by Lynn-Marie. 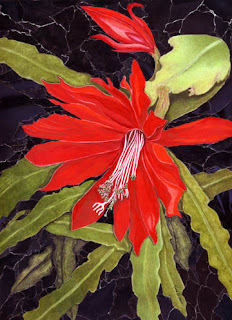 "Red Epi" is mixed media and collage. As some of you are aware, my wife's an artist. And being around cacti and succulents as much as we are, it's inevitable that the plants become the subject of the art on occasion. 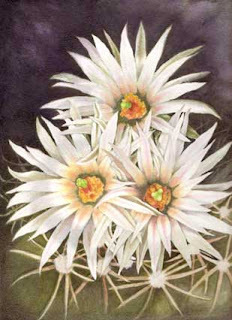 The following Escobaria image is an example. A larger image is found here. I'll be adding some other art works of her's in the next couple of weeks. Enjoy. Oh, and she reminds me...prints are for sale. Contact me for information. No pictures today. But I'll be adding some tomorrow. Our icy winter spell ended emphatically yesterday with temps around 60F and clear skies. The daffodils are coming up and some of the cacti are beginning to set blooms. More later.